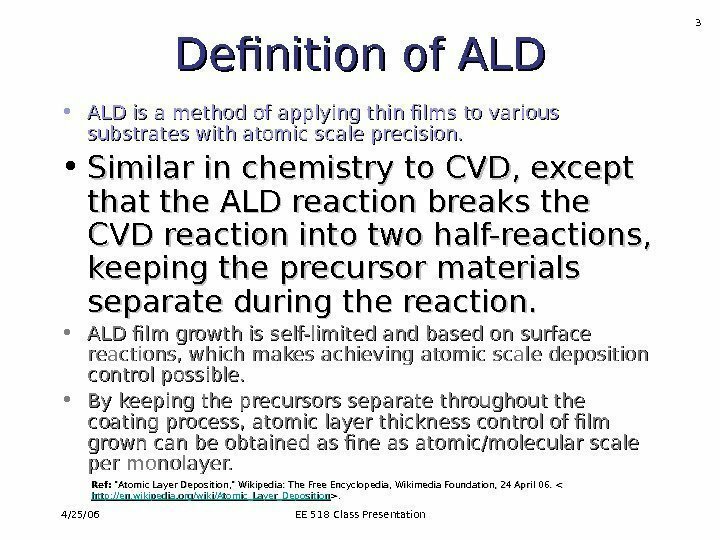 4/25/06 EE 518 Class Presentation 2 Definition of ALD • ALD is a method of applying thin films to various substrates with atomic scale precision. • Similar in chemistry to chemical vapor deposition (CVD), except that the ALD reaction breaks the CVD reaction into two half-reactions, keeping the precursor materials separate during the reaction. • ALD film growth is self-limited and based on surface reactions, which makes achieving atomic scale deposition control possible. • By keeping the precursors separate throughout the coating process, atomic layer thickness control of film grown can be obtained as fine as atomic/molecular scale per monolayer. Ref: «Atomic Layer Deposition, » Wikipedia: The Free Encyclopedia, Wikimedia Foundation, 24 April 06. . >. 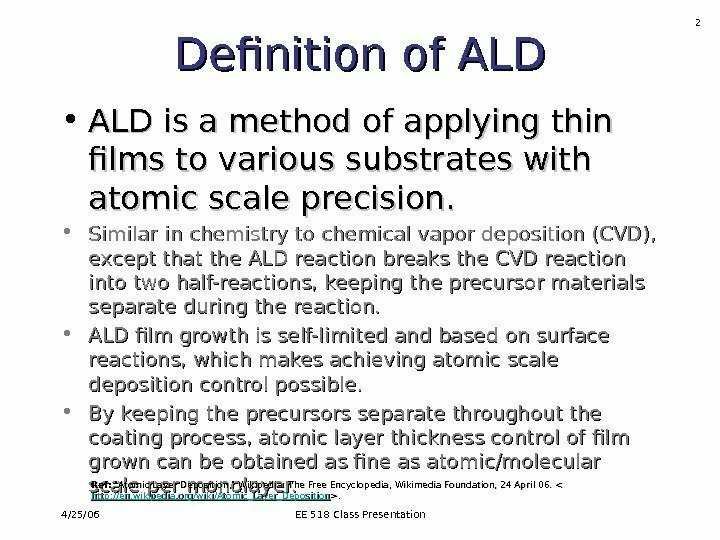 4/25/06 EE 518 Class Presentation 3 Definition of ALD • ALD is a method of applying thin films to various substrates with atomic scale precision. • Similar in chemistry to CVD, except that the ALD reaction breaks the CVD reaction into two half-reactions, keeping the precursor materials separate during the reaction. • ALD film growth is self-limited and based on surface reactions, which makes achieving atomic scale deposition control possible. • By keeping the precursors separate throughout the coating process, atomic layer thickness control of film grown can be obtained as fine as atomic/molecular scale per monolayer. Ref: «Atomic Layer Deposition, » Wikipedia: The Free Encyclopedia, Wikimedia Foundation, 24 April 06. . >. 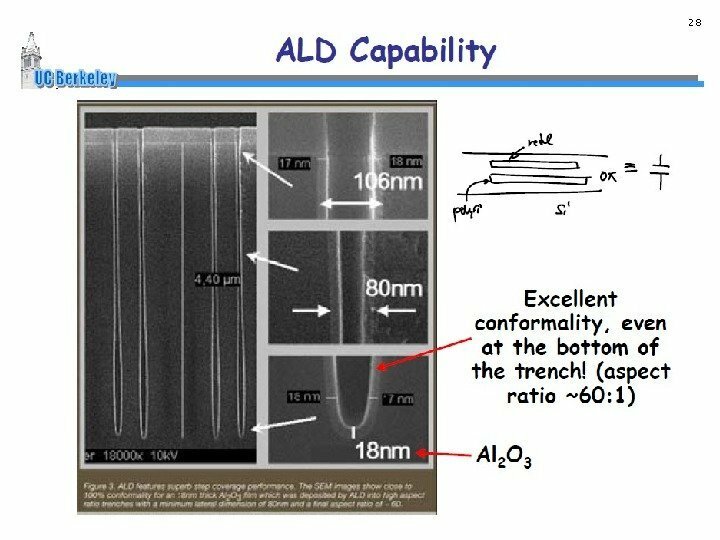 4/25/06 EE 518 Class Presentation 4 • ALD is a method of applying thin films to various substrates with atomic scale precision. • Similar in chemistry to chemical vapor deposition (CVD), except that the ALD reaction breaks the CVD reaction into two half-reactions, keeping the precursor materials separate during the reaction. • ALD film growth is self-limited and based on surface reactions , which makes achieving atomic scale deposition control possible. • By keeping the precursors separate throughout the coating process, atomic layer thickness control of film grown can be obtained as fine as atomic/molecular scale per monolayer. 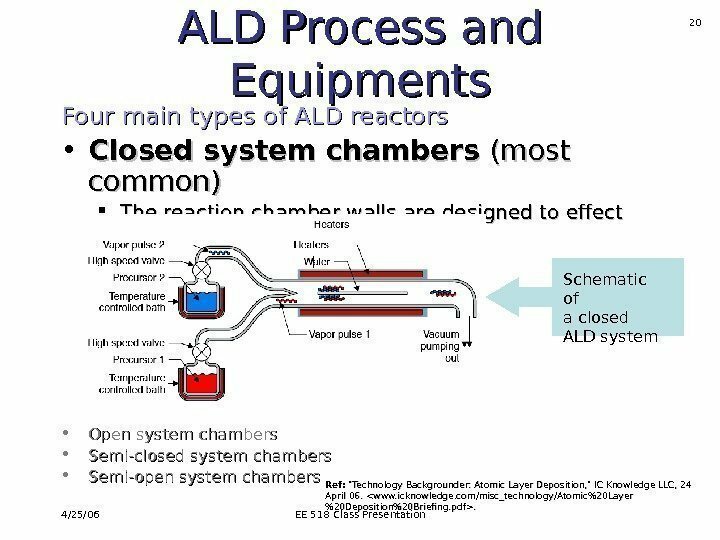 Definition of ALD Ref: «Atomic Layer Deposition, » Wikipedia: The Free Encyclopedia, Wikimedia Foundation, 24 April 06. . >. 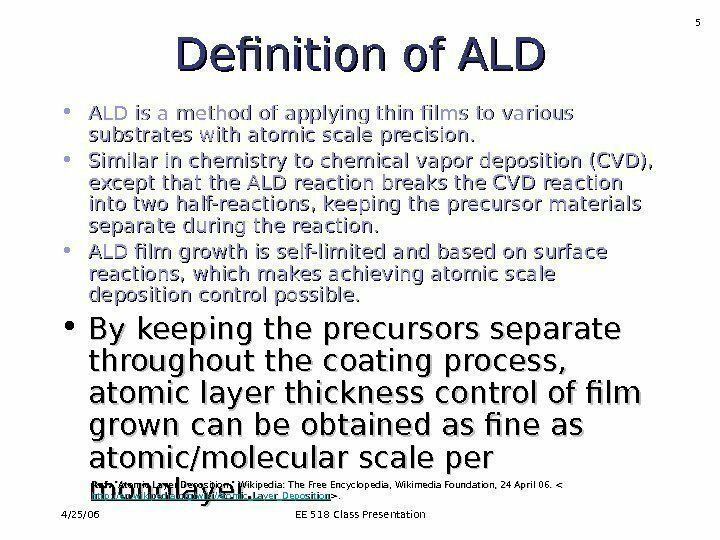 4/25/06 EE 518 Class Presentation 5 Definition of ALD • ALD is a method of applying thin films to various substrates with atomic scale precision. • Similar in chemistry to chemical vapor deposition (CVD), except that the ALD reaction breaks the CVD reaction into two half-reactions, keeping the precursor materials separate during the reaction. 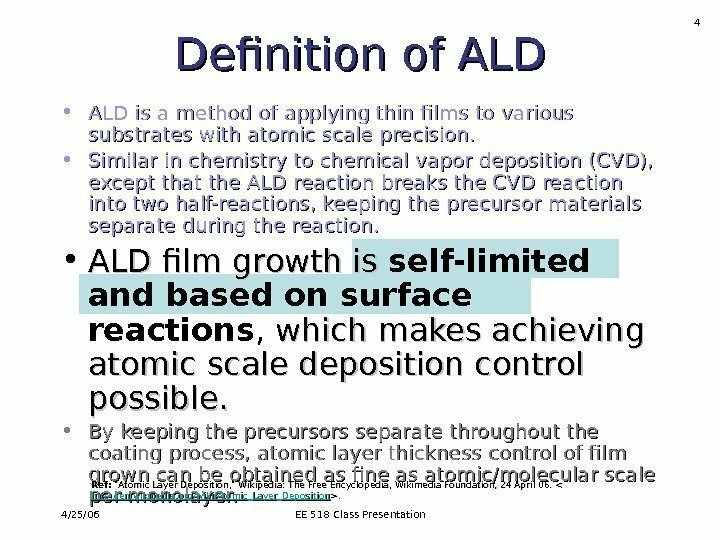 • ALD film growth is self-limited and based on surface reactions, which makes achieving atomic scale deposition control possible. • By keeping the precursors separate throughout the coating process, atomic layer thickness control of film grown can be obtained as fine as atomic/molecular scale per monolayer. Ref: «Atomic Layer Deposition, » Wikipedia: The Free Encyclopedia, Wikimedia Foundation, 24 April 06. . >. 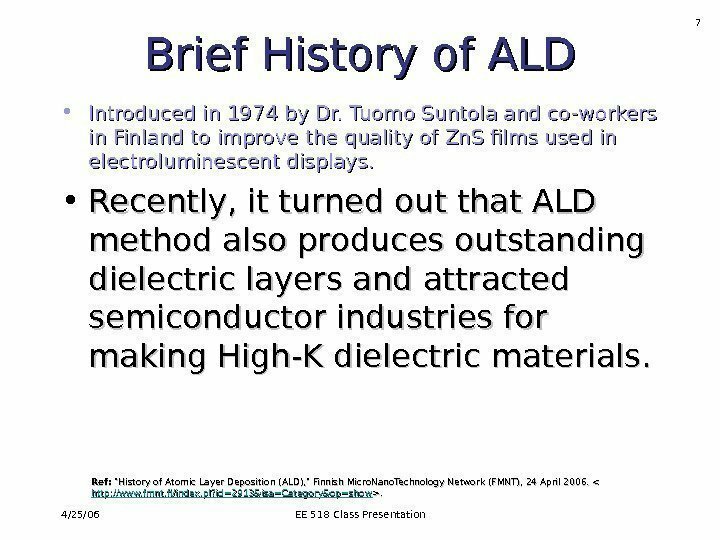 4/25/06 EE 518 Class Presentation 6 Brief History of ALD • Introduced in 1974 by Dr. Tuomo Suntola and co-workers in Finland to improve the quality of Zn. S films used in electroluminescent displays. • Recently, it turned out that ALD also produces outstanding dielectric layers and attracts semiconductor industries for making High-K dielectric materials. Ref: «History of Atomic Layer Deposition (ALD), » Finnish Micro. Nano. Technology Network (FMNT), 24 April 2006. . >. 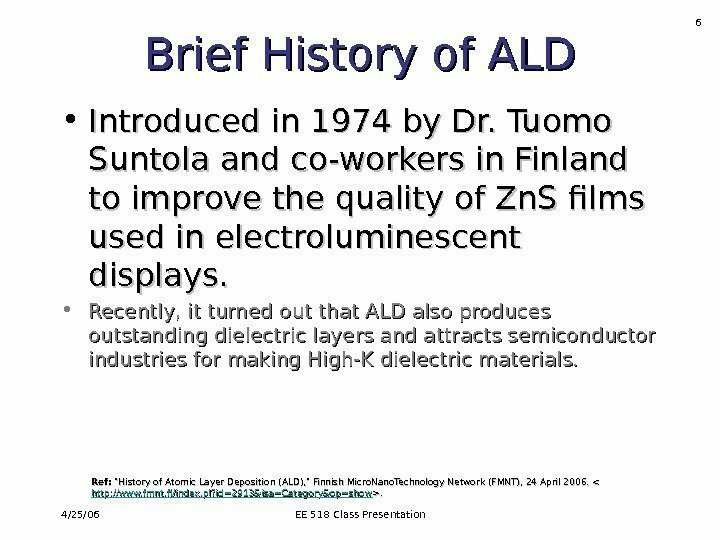 4/25/06 EE 518 Class Presentation 7 Brief History of ALD • Introduced in 1974 by Dr. Tuomo Suntola and co-workers in Finland to improve the quality of Zn. S films used in electroluminescent displays. 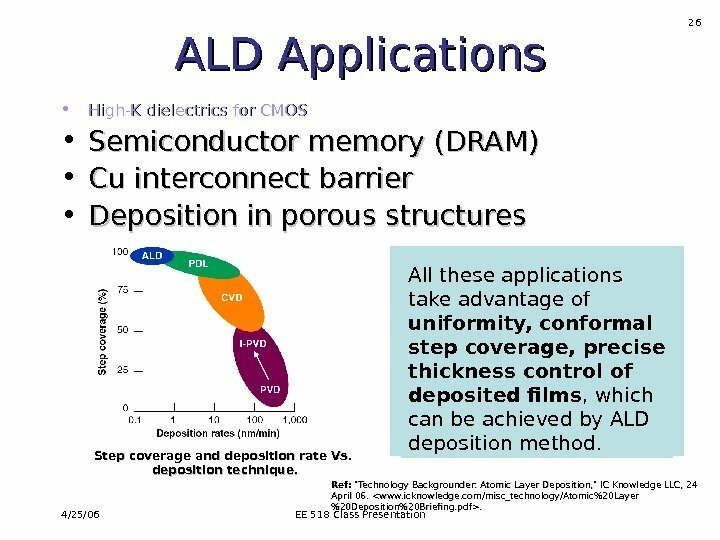 • Recently, it turned out that ALD method also produces outstanding dielectric layers and attracted semiconductor industries for making High-K dielectric materials. Ref: «History of Atomic Layer Deposition (ALD), » Finnish Micro. Nano. Technology Network (FMNT), 24 April 2006. . >. 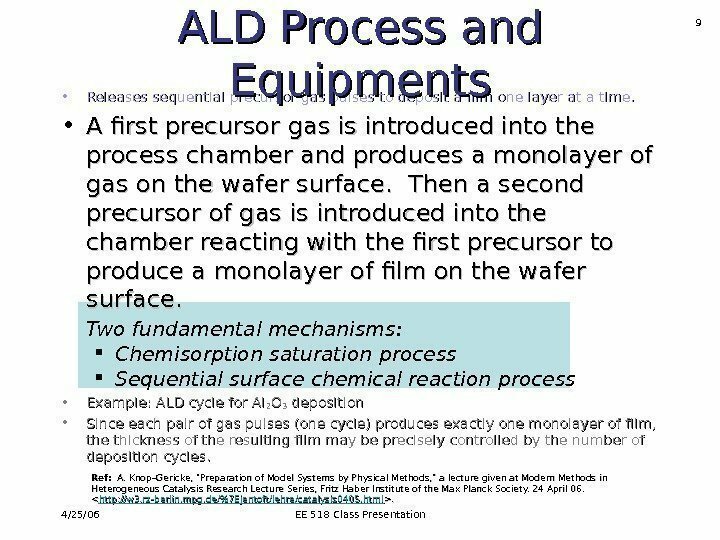 4/25/06 EE 518 Class Presentation 8 ALD Process and Equipments • Releases sequential precursor gas pulses to deposit a film one layer at a time on the substrate. • The precursor gas is introduced into the process chamber and produces a monolayer of gas on the wafer surface. A second precursor of gas is then introduced into the chamber reacting with the first precursor to produce a monolayer of film on the wafer surface. 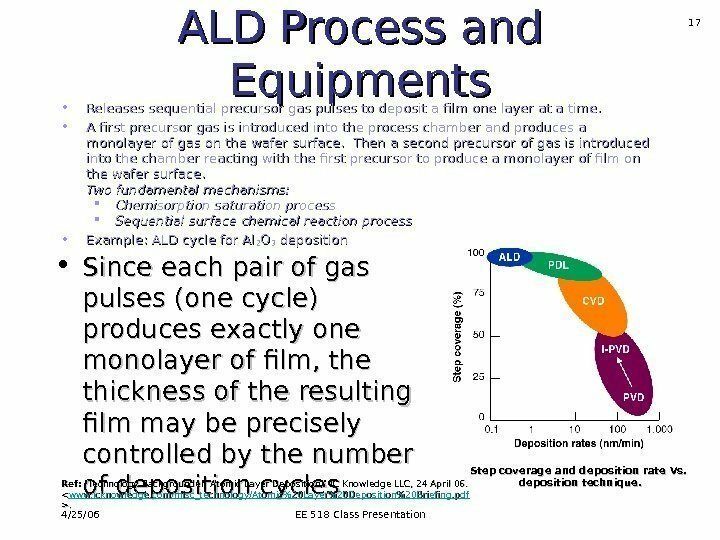 Two fundamental mechanisms: Chemisorption saturation process Sequential surface chemical reaction process • Example: ALD cycle for Al 22 OO 33 deposition • Since each pair of gas pulses (one cycle) produces exactly one monolayer of film, the thickness of the resulting film may be precisely controlled by the number of deposition cycles. Ref: A. Knop–Gericke, «Preparation of Model Systems by Physical Methods, » a lecture given at Modern Methods in Heterogeneous Catalysis Research Lecture Series, Fritz Haber Institute of the Max Planck Society. 24 April 06. <. >. 4/25/06 EE 518 Class Presentation 9 • Releases sequential precursor gas pulses to deposit a film one layer at a time. • A first precursor gas is introduced into the process chamber and produces a monolayer of gas on the wafer surface. Then a second precursor of gas is introduced into the chamber reacting with the first precursor to produce a monolayer of film on the wafer surface. Two fundamental mechanisms: Chemisorption saturation process Sequential surface chemical reaction process • Example: ALD cycle for Al 22 OO 33 deposition • Since each pair of gas pulses (one cycle) produces exactly one monolayer of film, the thickness of the resulting film may be precisely controlled by the number of deposition cycles. 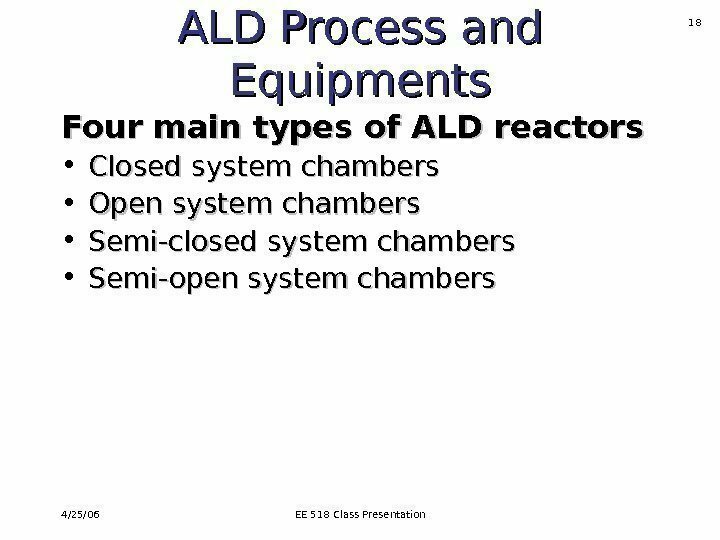 ALD Process and Equipments Ref: A. Knop–Gericke, «Preparation of Model Systems by Physical Methods, » a lecture given at Modern Methods in Heterogeneous Catalysis Research Lecture Series, Fritz Haber Institute of the Max Planck Society. 24 April 06. <. >. 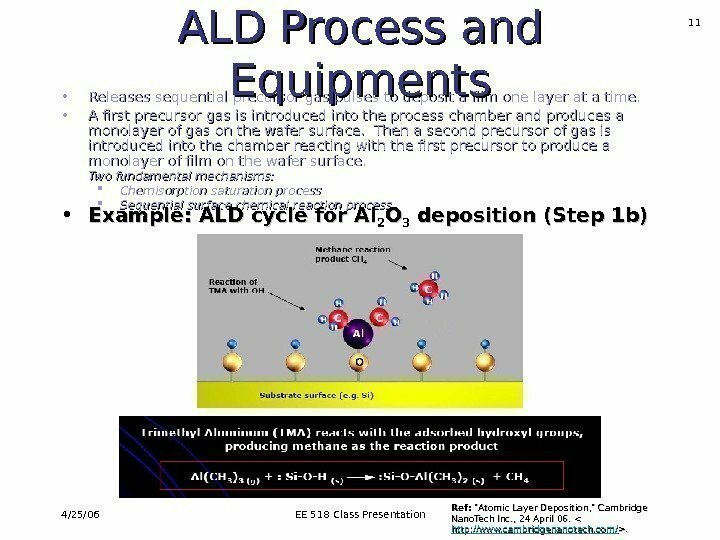 4/25/06 EE 518 Class Presentation 10 ALD Process and Equipments • Example: ALD cycle for Al 22 OO 33 deposition (Step 1 a) • Releases sequential precursor gas pulses to deposit a film one layer at a time. • A first precursor gas is introduced into the process chamber and produces a monolayer of gas on the wafer surface. Then a second precursor of gas is introduced into the chamber reacting with the first precursor to produce a monolayer of film on the wafer surface. Two fundamental mechanisms: Chemisorption saturation process Sequential surface chemical reaction process Ref: «Atomic Layer Deposition, » Cambridge Nano. Tech Inc. , 24 April 06. . >. 4/25/06 EE 518 Class Presentation 11 • Releases sequential precursor gas pulses to deposit a film one layer at a time. • A first precursor gas is introduced into the process chamber and produces a monolayer of gas on the wafer surface. Then a second precursor of gas is introduced into the chamber reacting with the first precursor to produce a monolayer of film on the wafer surface. 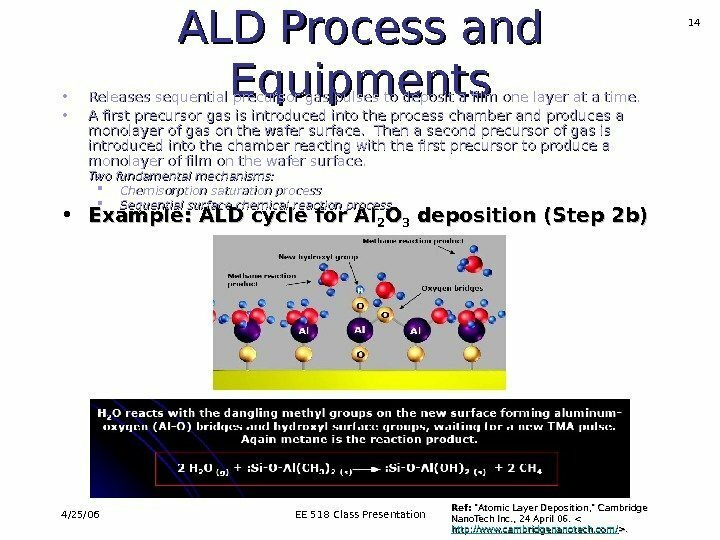 Two fundamental mechanisms: Chemisorption saturation process Sequential surface chemical reaction process ALD Process and Equipments • Example: ALD cycle for Al 22 OO 33 deposition (Step 1 b) Ref: «Atomic Layer Deposition, » Cambridge Nano. Tech Inc. , 24 April 06. . >. 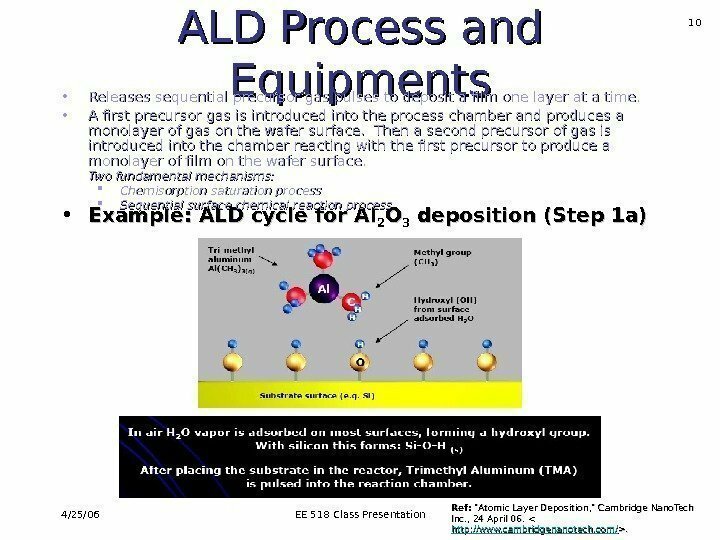 4/25/06 EE 518 Class Presentation 12 ALD Process and Equipments • Example: ALD cycle for Al 22 OO 33 deposition (Step 1 c) • Releases sequential precursor gas pulses to deposit a film one layer at a time. • A first precursor gas is introduced into the process chamber and produces a monolayer of gas on the wafer surface. Then a second precursor of gas is introduced into the chamber reacting with the first precursor to produce a monolayer of film on the wafer surface. Two fundamental mechanisms: Chemisorption saturation process Sequential surface chemical reaction process Ref: «Atomic Layer Deposition, » Cambridge Nano. Tech Inc. , 24 April 06. . >. 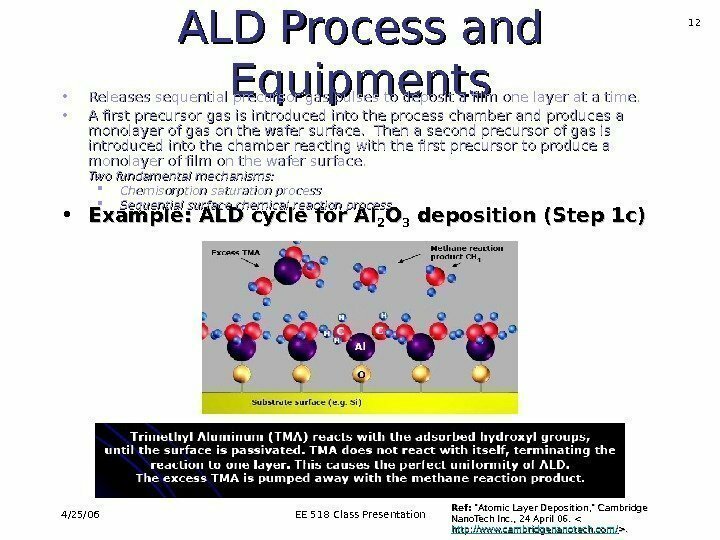 4/25/06 EE 518 Class Presentation 13 ALD Process and Equipments • Example: ALD cycle for Al 22 OO 33 deposition (Step 2 a) • Releases sequential precursor gas pulses to deposit a film one layer at a time. • A first precursor gas is introduced into the process chamber and produces a monolayer of gas on the wafer surface. Then a second precursor of gas is introduced into the chamber reacting with the first precursor to produce a monolayer of film on the wafer surface. Two fundamental mechanisms: Chemisorption saturation process Sequential surface chemical reaction process Ref: «Atomic Layer Deposition, » Cambridge Nano. Tech Inc. , 24 April 06. . >. 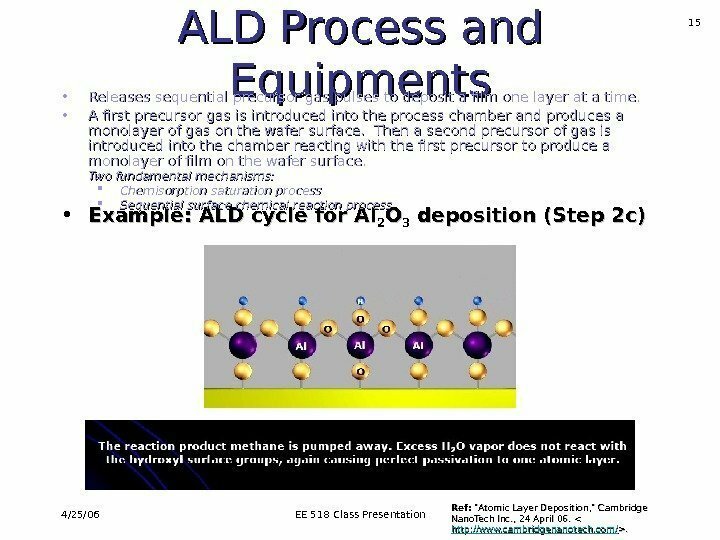 4/25/06 EE 518 Class Presentation 14 ALD Process and Equipments • Example: ALD cycle for Al 22 OO 33 deposition (Step 2 b) • Releases sequential precursor gas pulses to deposit a film one layer at a time. • A first precursor gas is introduced into the process chamber and produces a monolayer of gas on the wafer surface. Then a second precursor of gas is introduced into the chamber reacting with the first precursor to produce a monolayer of film on the wafer surface. Two fundamental mechanisms: Chemisorption saturation process Sequential surface chemical reaction process Ref: «Atomic Layer Deposition, » Cambridge Nano. Tech Inc. , 24 April 06. . >. 4/25/06 EE 518 Class Presentation 15 ALD Process and Equipments • Example: ALD cycle for Al 22 OO 33 deposition (Step 2 c) • Releases sequential precursor gas pulses to deposit a film one layer at a time. • A first precursor gas is introduced into the process chamber and produces a monolayer of gas on the wafer surface. Then a second precursor of gas is introduced into the chamber reacting with the first precursor to produce a monolayer of film on the wafer surface. Two fundamental mechanisms: Chemisorption saturation process Sequential surface chemical reaction process Ref: «Atomic Layer Deposition, » Cambridge Nano. Tech Inc. , 24 April 06. . >. 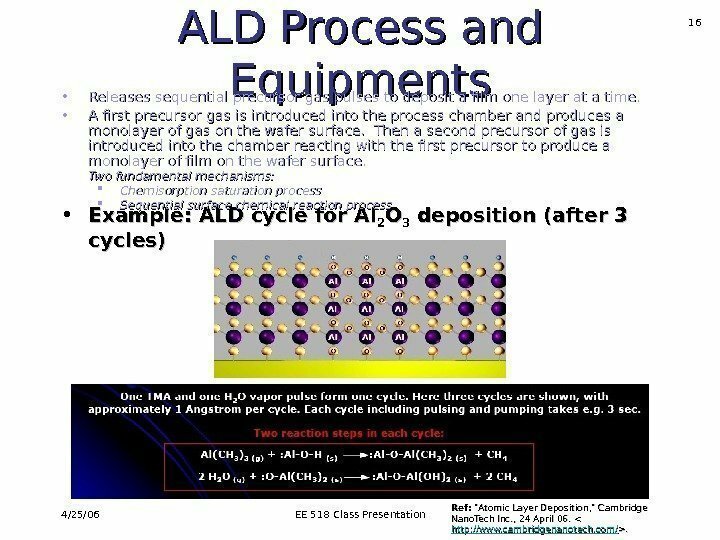 4/25/06 EE 518 Class Presentation 16 ALD Process and Equipments • Example: ALD cycle for Al 22 OO 33 deposition (after 3 cycles) • Releases sequential precursor gas pulses to deposit a film one layer at a time. • A first precursor gas is introduced into the process chamber and produces a monolayer of gas on the wafer surface. Then a second precursor of gas is introduced into the chamber reacting with the first precursor to produce a monolayer of film on the wafer surface. Two fundamental mechanisms: Chemisorption saturation process Sequential surface chemical reaction process Ref: «Atomic Layer Deposition, » Cambridge Nano. Tech Inc. , 24 April 06. . >. 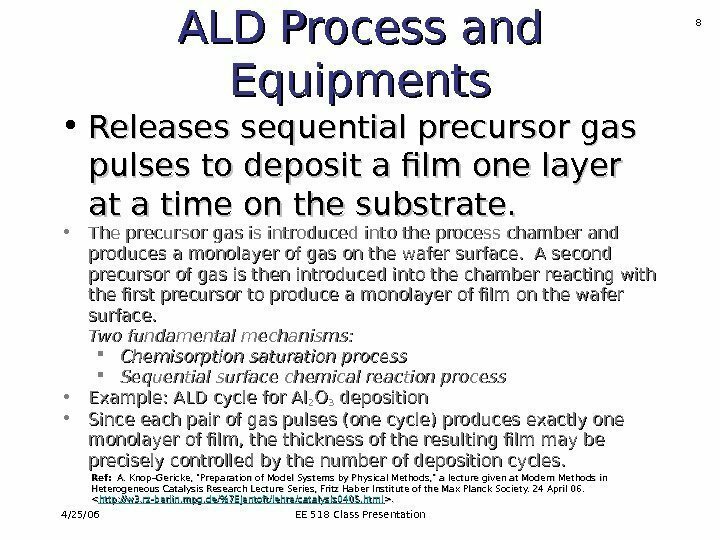 4/25/06 EE 518 Class Presentation 17 ALD Process and Equipments • Releases sequential precursor gas pulses to deposit a film one layer at a time. • A first precursor gas is introduced into the process chamber and produces a monolayer of gas on the wafer surface. Then a second precursor of gas is introduced into the chamber reacting with the first precursor to produce a monolayer of film on the wafer surface. Two fundamental mechanisms: Chemisorption saturation process Sequential surface chemical reaction process • Example: ALD cycle for Al 22 OO 33 deposition • Since each pair of gas pulses (one cycle) produces exactly one monolayer of film, the thickness of the resulting film may be precisely controlled by the number of deposition cycles. Ref: «Technology Backgrounder: Atomic Layer Deposition, » IC Knowledge LLC, 24 April 06. <. >. Step coverage and deposition rate Vs. deposition technique. 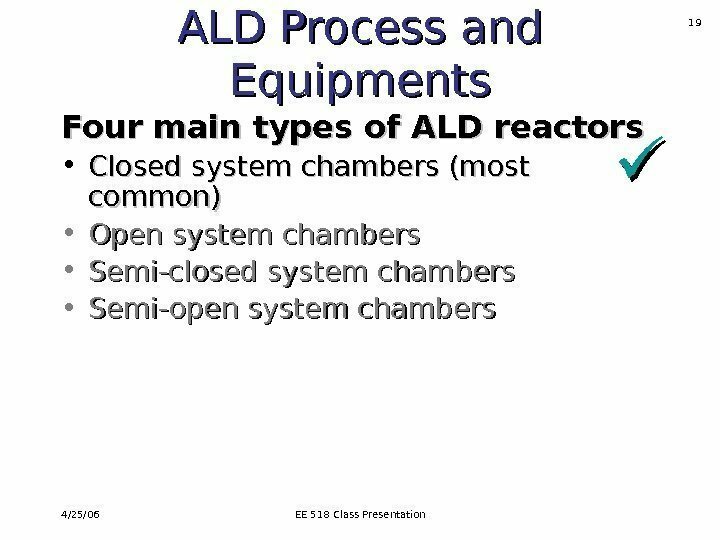 4/25/06 EE 518 Class Presentation 20 ALD Process and Equipments Four main types of ALD reactors • Closed system chambers (most common) The reaction chamber walls are designed to effect the transport of the precursors. 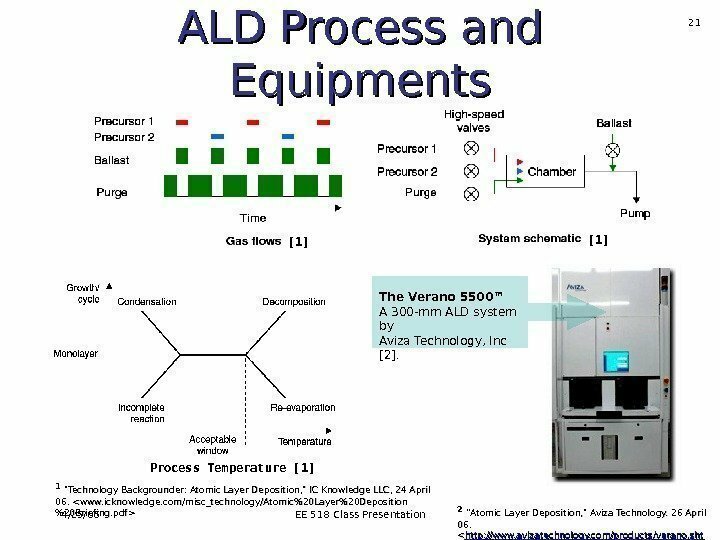 • Open system chambers • Semi-closed system chambers • Semi-open system chambers Schematic of a closed ALD system Ref: «Technology Backgrounder: Atomic Layer Deposition, » IC Knowledge LLC, 24 April 06. .
4/25/06 EE 518 Class Presentation 21 ALD Process and Equipments The Verano 5500™ A 300 -mm ALD system by Aviza Technology, Inc . 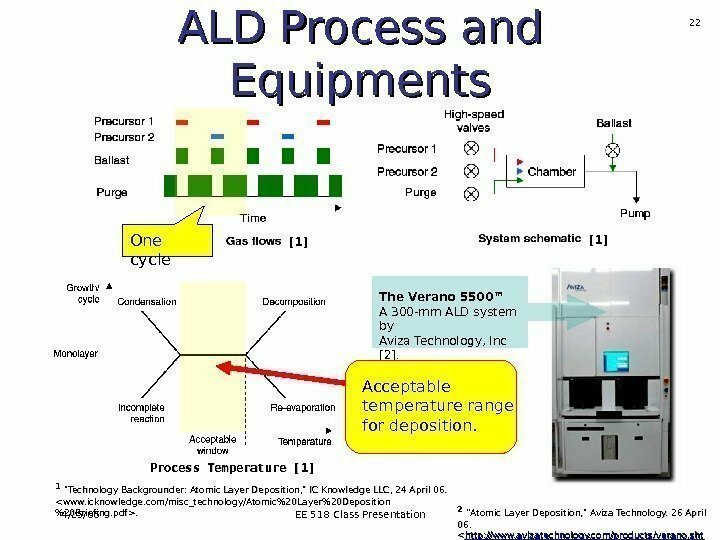 Process Temperature   11 «Technology Backgrounder: Atomic Layer Deposition, » IC Knowledge LLC, 24 April 06. 22 ”Atomic Layer Deposition, » Aviza Technology. 26 April 06. <. >. 4/25/06 EE 518 Class Presentation 22 ALD Process and Equipments The Verano 5500™ A 300 -mm ALD system by Aviza Technology, Inc . One cycle Process Temperature   Acceptable temperature range for deposition. 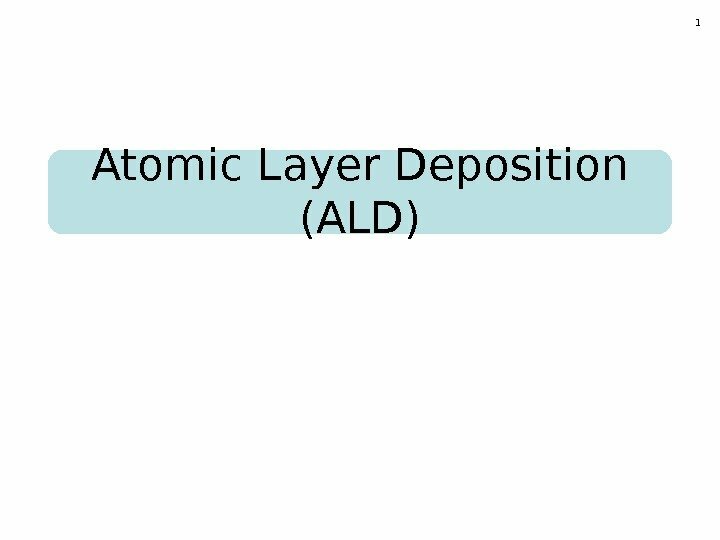 11 «Technology Backgrounder: Atomic Layer Deposition, » IC Knowledge LLC, 24 April 06. . 22 ”Atomic Layer Deposition, » Aviza Technology. 26 April 06. <. >. 4/25/06 EE 518 Class Presentation 25 Candidates for High-K dielectrics Film Precursors Al. Al 22 OO 33 Al(CH) 33 , H, H 22 O or O 33 Hf. O 22 Hf. Cl 44 or TEMAH, H 22 OO Zr. O 22 Zr. 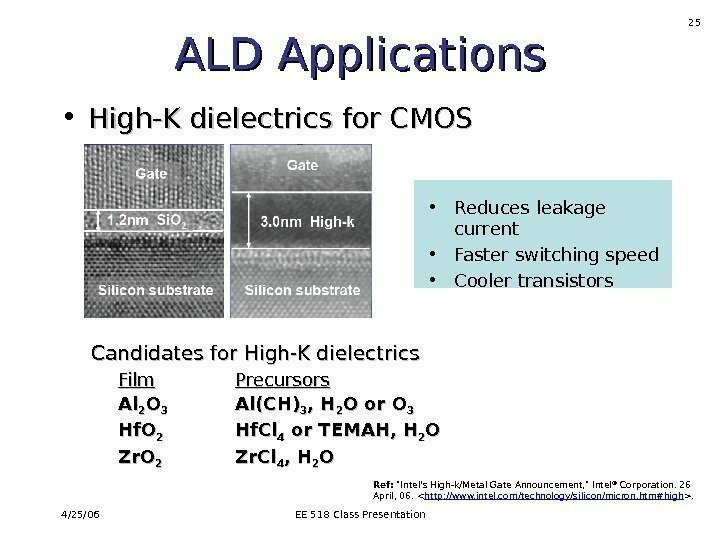 Cl 44 , H, H 22 OOALD Applications • High-K dielectrics for CMOS • Reduces leakage current • Faster switching speed • Cooler transistors Ref: «Intel’s High-k/Metal Gate Announcement, » Intel ® Corporation. 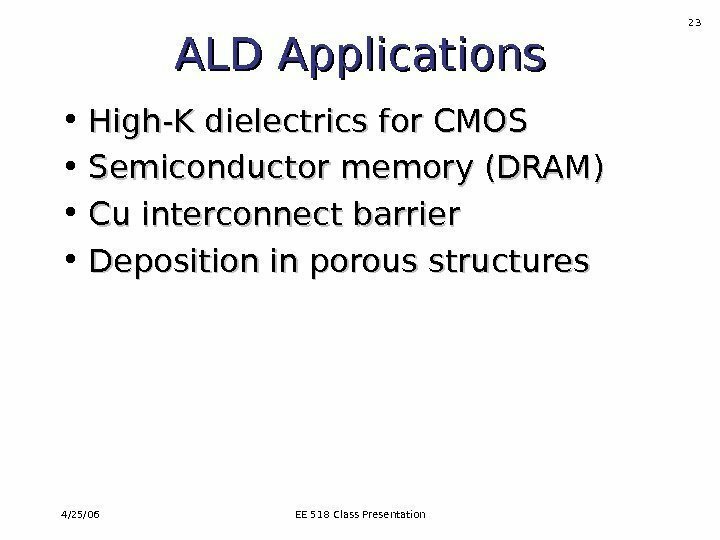 26 April, 06. .
4/25/06 EE 518 Class Presentation 26 ALD Applications • High-K dielectrics for CMOS • Semiconductor memory (DRAM) • Cu interconnect barrier • Deposition in porous structures All these applications take advantage of uniformity, conformal step coverage, precise thickness control of deposited films , which can be achieved by ALD deposition method. Step coverage and deposition rate Vs. deposition technique. 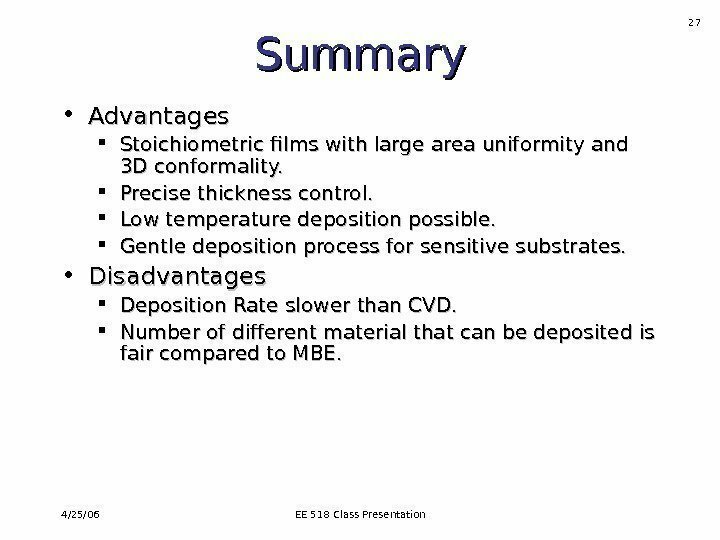 Ref: «Technology Backgrounder: Atomic Layer Deposition, » IC Knowledge LLC, 24 April 06. .
4/25/06 EE 518 Class Presentation 27 Summary • Advantages Stoichiometric films with large area uniformity and 3 D conformality. Precise thickness control. Low temperature deposition possible. Gentle deposition process for sensitive substrates. • Disadvantages Deposition Rate slower than CVD. Number of different material that can be deposited is fair compared to MBE.